With 25 million residents, Delhi is the world’s second most populous city. It is the capital city of India, and as one of the oldest continuously inhabited cities in the world, it boasts of a unique history and culture. But the city also includes over a hundred villages within its administrative borders. Large slums were created when people from the hinterland migrated to the city, which was not prepared for such an influx of people. While these communities are largely unlettered, they are determined and hardworking. VIDYA has been helping these communities as an NGO for thirty years. We believe that they can be empowered to become models for sustainability and prosperity to the rest of the country. We believe that less-privileged students should have access to the same quality of education available at the country’s best schools. Inaugurated in November 2009, in Gurgaon, Haryana, near Delhi, the VIDYA School is a state-of-the-art English medium school that houses classrooms, labs, computers, library and sports grounds on 5 acres of land, with a built up area of 76,000 square feet. It was CBSE-certified upto Class XII in 2015, and the quality of its education and facilities are on par with some of the best public schools in the city. This year, we won the British Council International School Award! Our vision here is to provide 1000+ slum children with a high quality education, with the best infrastructure and facilities. We aim to make them well equipped to utilize the opportunities of India’s emerging economy, second to none in their ability to compete, excel and lead India into the future. Admission is open for only those whose monthly income is below Rs. 10,000/-. During admissions, special preference is given to the girl child and children of single parents. We endeavour to provide quality education to the less privileged along with nutrition, uniforms and transport facilities at minimal cost. Kushi, A student of class III, secured the 25th rank in the highly prestigious and competitive International English Olympiad Examination. Another student, Sanajan, of class VIII, received a scholarship for excellence in academics from the Olympiad Association. This year, one of our 10th standard students scored a perfect 10.0 CGPA, several students were close behind, and all scored first divisions! Both the state level education board of the government of Haryana and the Central Board of Secondary Education were so impressed by the services and contribution of VIDYA School to the community that they accorded recognition and affiliation to the school in a very short span of time in 2013. Recently, the school submitted evidences of assessment in academic discipline to the CBSE and received a certificate of extraordinary achievement from the Board. The VIDYA School has also been selected from among 20 prestigious schools of Delhi/NCR for the innovative TOD FOD JOD project organized by the National Innovation Council headed by Sam Pitroda. We also won the British Council International school award, the Brainfeed award 2017, and the Life Empowerment Award! 100+ students qualify for MENSA. Our innovative VIDYA MiTR program was also first inaugrated at the VIDYA School! The faculty and staff always put in extra efforts to train the students and to prepare them for their Annual Board exams. Currently, the school has 1100+ children. 2. Increasing number of sections per class. 3. Upgrading and enhancing facilities and infrastructure. Bal Vihar is the very root of the VIDYA Movement as it stands today– it was VIDYA’s first program, started 32 years ago. Since then, it has provided education for more than 12,000 children! Bal Vihar is a primary school for the 300+ first-generation learners living in the surrounding slum communities. The school provides English-medium education from preschool till 5th standard. In addition to academics, students are provided a nutritious midday meal and exposed to arts and crafts, music and dance and sports activities. The school runs in two shifts to accommodate more children, all of whom come to school eagerly. Over the years, the dropout rate has dropped drastically. The parents now understand the importance of educating their children, especially their daughters– the number of girl students has increased to a healthy 50:50 ratio. After completing 5th standard, we assist families navigate the daunting task of enrolling their children into secondary public schools. Some students have even gone on to graduate from college! 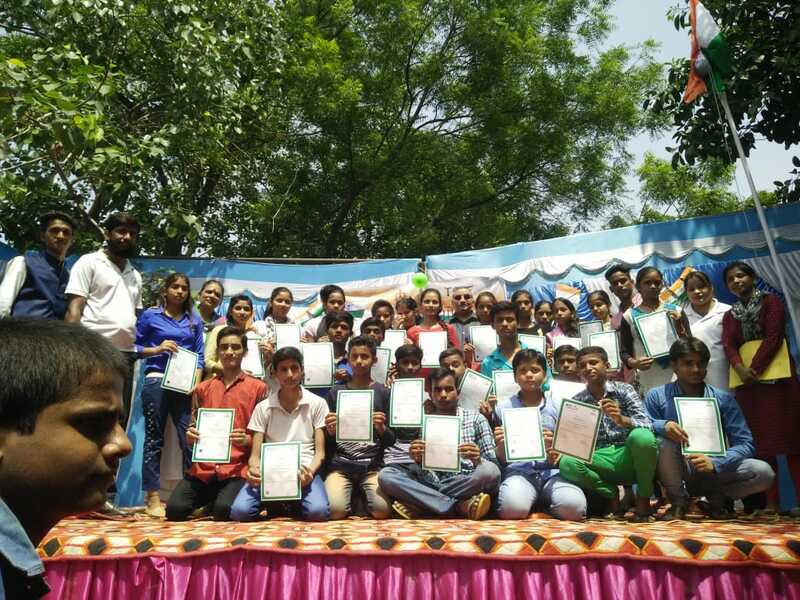 Bal Vihar’s goal for this year is to start a computer centre for the children and community, and also add classes up to the 8th standard. Each child at BalVihar has a dream and the school nurtures those dreams with fun-filled, immersive education. The Bal Vihar model is so effective that we used have used it in our PPP partnership with the Delhi government to fully manage government schools. We started with just one, but within a year we’re already fully managing three government primary schools in HauzKhas, PTS Colony and Sarvapriya Vihar! Bal Vihar is entirely funded by our wonderful donor partners at Punjab National Bank Housing Finance Ltd.
We believe that dropout youth deserve a second-chance at realizing their potential and working towards their dreams. The Bridge Course Projects at Gurgaon and IIT Delhi follow the National Institute of Open Schooling (NIOS) program. NIOS gives youth who have dropped out of school by a second chance at completing high school. Till date, 2,500 students have gone through these projects and all have successfully passed their 10th and 12th standard exams. Over 100 youth are currently enrolled. Besides regular classes, students participate in extracurricular activities of sports, dance, drama, computer basics, English speaking and other awareness programs. Students are provided guidance in their career development through admissions in vocational training programs, such as hospitality and retail, which lead to many getting jobs in renowned hotels; they are also mentored by volunteers from various organizations. Students gain a sense of self worth, value, and a spirit of empowerment to better their lives. This year, we aim to integrate the NIOS programs with the vocational training initiatives. Families living in this community were resettled to their current location in 1997 so that urban construction could commence on their former land. With few resources and little help from anyone, VIDYA stepped in to help this disoriented community. First generation learners, especially at public schools, are at risk of dropping out due to lack of support at home and from their public school. This project offers an array of programs to 250 children and women from this community. Students that are attending public schools but need additional support for their performance in core subjects attend the remedial education program. Apart from academic support, students participate in various life enriching programs. Including a very successful computer basics program in partnership with NIIT, which help them to become competent and confident individuals. Women within the community also attend classes to learn essential skills such as reading, writing, tailoring and computer basics. The project strives to empower the women of this community and gives them skills to help them provide financially for their families. The women and children who attend Pappankalan are planting seeds of change within themselves, their families, and their communities. We aim to make the community sustainable and to start a primary school here. The Okhla Community Project provides pivotal education to women and children since 2008, in one of South Delhi’s biggest industrial slums. First generation learners in public schools are at high risk of dropping due to lack of support. This project caters to over 400 children, youth and women. We run the beyond school program here to provided a more rounded education, and also remedial education, which is for students who are attending public schools but need additional support to improve their academic performance in core subjects. Additionally, youth from the community utilize the project’s computer center and young girls are also offered classes in Indian Classical dance. Women from the community attend classes in English literacy and computer basics. Children and youth are allowed the opportunity to learn and gain knowledge which fuels their determination to move forward with their educational and career goals. VIDYA appreciates the role sports plays in the life of an individual, and would like to provide sports training to boys & girls in the community in future. 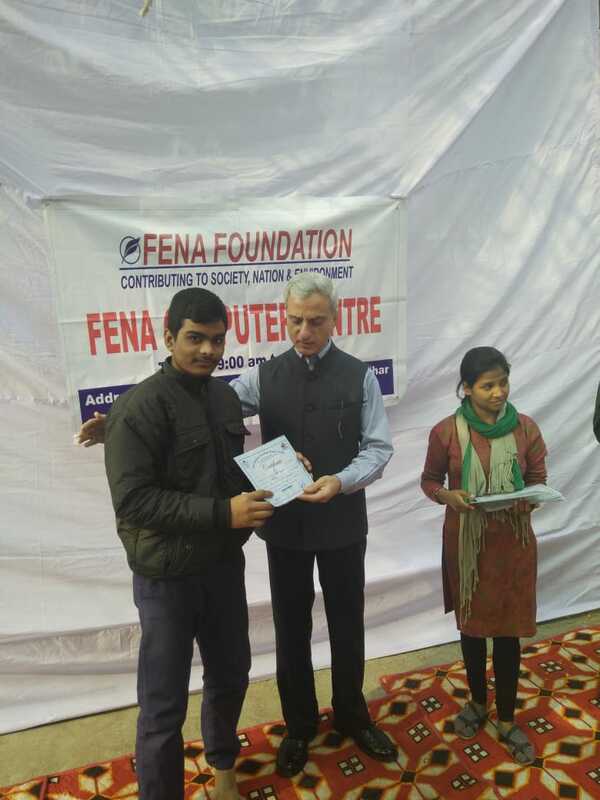 The computer center at Okhla is sponsored by FENA Foundation, and is running successfully due to their generous support! The Indian Institute of Technology (IIT), New Delhi was the location of the first program of VIDYA almost thirty years ago. Today, in partnership with National Social Service (NSS), women and children continue to be educated and empowered here. VIDYA is honoured to have a partnership with the Indian Institute of Technology, New Delhi, where it runs this project on their premises. Children from surrounding slum communities are offered remedial education. As first generation learners, they are at risk of dropping out of school. Therefore it is essential that they get this individualized help to prevent them from getting lost in the public school system. Additionally, in partnership with the National Institute of Open Schooling (NIOS) program, youth who have dropped out of school are able to enrol in classes and are given a second chance at completing high school. Besides academics, students are also provided computer classes. Enthusiastic women from the community participate in basic literacy which increases their self-confidence and pride. 130 children, youth and women are supported in this programme by several volunteers from IIT and NSS. The VIDYA Mandira Women’s program is named after the late Mrs.Mandira Mukherjee, a VIDYA veteran who was an inspiration to us all. It was one of her dreams to start a women’s program at VIDYA Delhi. VIDYA shares her belief that women’s empowerment comes not just from awareness, but from actually enabling women to become independent of their own effort. We aim to soon turn this into a center that provides high quality vocational training, awareness programs and practical knowledge to women from the surrounding slum communities, and a hub for enabling women’s entrepreneurship. We offer professional training in stitching and tailoring from this centre, with a a structured curriculum focused on gaining proficiency for employability and building confidence . The course leads to a certification by USHA to work as trainers, from home, take up jobs or start a micro enterprise to make bags/uniforms! As with all courses at VIDYA, this centre also conducts programs in IT Skills, Spoken english, and life skills to significantly boost employability. We are looking to start courses in cooking, baking and cosmetology in 2018. The center is generously sponsored by Federal Mogul, and we’re also partnered with NIIT for the IT courses. The VIDYA Deep Program was launched in March 2017. 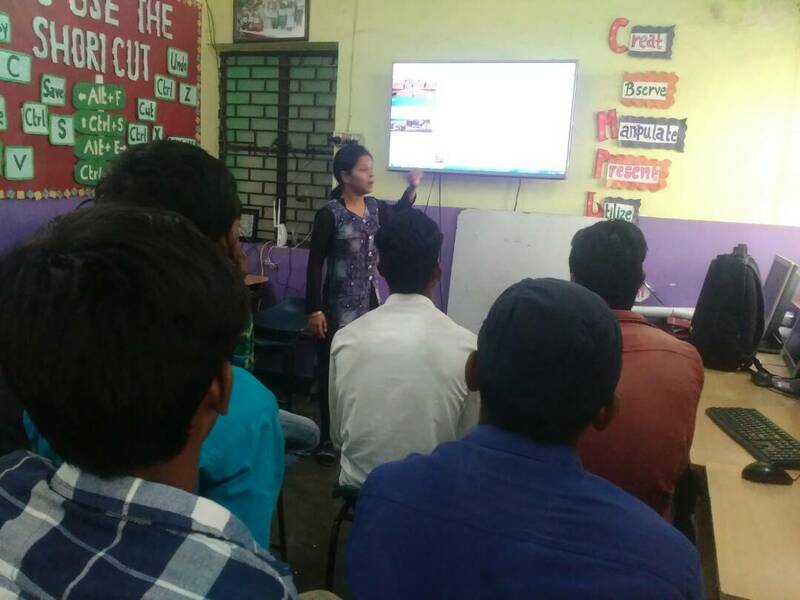 It provides basic computer literacy, life skills and spoken English skills to the employed youth of the community to help them scale up their career paths. The computer course uses the NIIT curriculum & 40 students have already got a NIIT certification after having passed the exam. As of December 2017, 3 batches have already completed this course.